The main phases of early tetrapod evolution took place in the Carboniferous period (354-290 Myr ago). 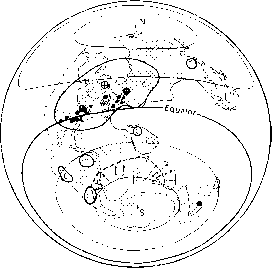 By that time, most of the continents were coalescing into a supercontinent, and land was continuous from Europe to North America, South America and Africa, with no intervening Atlantic Ocean (Figure 4.7). Much of Europe and North America lay around the Carboniferous equator, and tropical conditions prevailed in Carboniferous tetrapod localities. eventually turned into coal. The trees provided new habitats for flying insects, including some giant forms like dragonflies with the wingspans of pigeons. The decaying plant matter and undergrowth provided even richer habitats for ground-dwelling insects, spiders, scorpions and millepedes (some up to 1.8 m long). These new habitats opened up great possibilities for the early tetrapods, and they diversified extensively. Some forms continued to exploit freshwater fishes by becoming secondarily aquatic, whereas others became adapted to feed on the insects and millepedes. Early Carboniferous tetrapods were poorly known until recent work on localities in Scotland (see Box 4.3) revealed extensive faunas. Late Carboniferous tetrapods, on the other hand, are well known from Europe and North America in particular.